JL: It’s about finding myself living on my own for the first time in my life and the ups and downs it brought. This included being burgled, my car being stolen, and my cat getting shot in the head with an air rifle. Oh, and also doing my own house experiments, like putting ice cubes in my kettle to see how long it took to boil (twice as long). CB: Why did you write this show? JL: It’s my first hour so I wrote a show that says a lot about me, it’s basically a beginners’ guide to Jake Lambert. Which is also the name of the manual I gave my girlfriend when we first got together. CB: What comedians and comedy writers have impacted the way you write your show structures and material? JL: I’d like to think none of them, hopefully it’s just the show I would have written if the Edinburgh Fringe had started for the first time this year and no comedian had ever performed there before. I would like to think my instinct would be to perform an hour which introduced people to me, had a narrative, some shorter stories within it, plenty of jokes along the way, and a little something for the audience to take away with them. JL: Write what you know, as I mentioned before my show includes me talking about my cat getting shot in the head, the chances are I’m the only person on the fringe talking about that (unless whoever shot him is also a comedian). Also write how you know to, it’s always clear when somebody is heavily influenced by someone else, being influenced lightly is fine because if you see something you like then it’s probably because it’s a bit of you, but any more than that and you’ll be a poor version of someone else, instead of a brilliant version of you. And in the wise words of Kimberly “Sweet Brown” Wilkins ‘Aint nobody got time for that!’ (feel free to turn to Google to fully appreciate that reference). 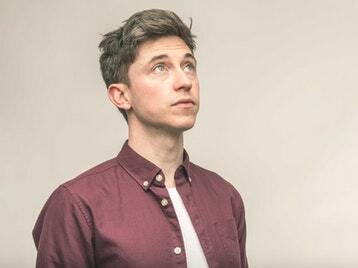 Jake Lambert will perform his show Little Lost Lad at the Edinburgh Festival.